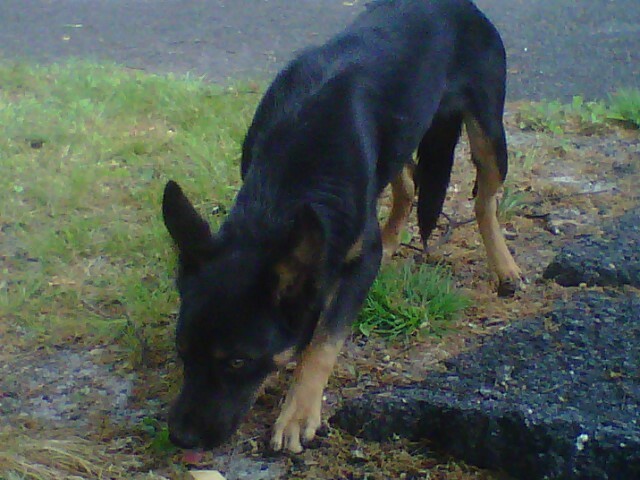 For the last week or so a stray dog, still a puppy by my estimate, has been hanging around the campus where I work. He’s wily, as he knows to avoid any campus vehicle or police car. He isn’t afraid so much as wary of humans. I highly doubt he’s ever experienced the joy of a belly rub or a scratch behind the ears. He’s too thin and the odds work against him the longer he fends for himself. I see his life as a symptom of what’s wrong with our society. Endless numbers of people pass by and don’t even see him. Some see him, but don’t even slow down. Only one here and there offer aid. It doesn’t require a leap in imagination to conjecture the same thing occurs with his human counterparts. People don’t want to bother. It isn’t their problem. I feel bad for him and have given him food, just as I saw another student do. I called the local animal shelter, but the odds they’ll look for him are slim. If the animal isn’t confined in some manner, they don’t bother. I understand they lack the resources to actively search for every reported stray. What I don’t understand is someone’s view that it is better for this guy to live the life he’s living than to get picked up by the pound. If he’s not feral or sick they WILL try to adopt him out. In a few weeks temperatures will be in the nineties. There won’t be any ready access to water. Not to mention he must cross massively busy streets. I witnessed a near miss just today. A lady on a Facebook page where I posted his picture, on the slim chance he might be lost, went on a rant against the animal shelter. She’d rather he roam, always hungry and thirsty, too hot or too cold, always fearful, and in constant misery, than to have a chance, even a slim one, at finding a life with a family who will love and care for him. Yes, the shelter is a kill shelter. The local non-kill shelter won’t come pick up strays. They simply don’t have the funds or the space. All the local rescue groups are up to their eyeballs in animals and have been for a number of years. I’m one of those people who would rescue them all if I could, but I can’t. The lady who ranted against the shelter didn’t offer to take him in, so who is she to criticize the facility for doing their best against overwhelming odds? When I was looking for a second dog, back when I just had Marble, I visited the pound and the Humane Society, and contacted multiple rescue groups. I was looking for a puppy, not b/c I didn’t want an older dog (Marble was a adult dog from the Humane Society when I adopted her), but b/c of Marble’s personality quirks. I felt it would be less stressful all-around to introduce a young dog she could “teach” rather than an older one that she’d have to battle for top-dog rights. Seeing as she only sees myself and Soup King as higher in rank than her (and she only granted him that right I think b/c I let him feed her for many months). Anyway, when I was at the shelter a couple came in with an adorable small, female, dog. The woman was surrendering her. Not only was she handing over this perfectly healthy dog, but turns out she’d never bothered naming her even though she’d had her for over a year. Yesterday when I was offering the stray some food, a stranger commented that it was nice of me to do that. I suppose. I view it more as what I’d want someone to do for me if the situation were reversed. I didn’t go to any great expense or effort. It took very little time. Have we sunk so low as a society that something as simple as being nice is praised b/c of its rarity? Sure, I could rant about the issues of pet over-population and irresponsible owners, but even worse is this pervasive attitude that others’ lives and problems are somehow less important than yours. If people can treat a helpless animal with cruelty, that behavior likely extends into their human relationships. It’s easy to point the finger at those people, but apathy is no better. It’s why our freedoms are slipping through our fingers. It’s why the public school system is crumbling into rubbish. It’s why we have corrupt politicians running things. Change doesn’t happen because you sit around waiting for others to do something. You see a wrong and step forward to right it in whatever small way you can. It is the accumulation of many small acts which culminates in change. He'll come within inches of me now, but won't eat out of my hand yet.